The fact that people die by suicide has been around for hundreds of year. I am going to focus on the present times with this article and what comments are said or heard after a suicide death has occurred; especially if you are on the receiving end of those comments. It was their time to go; it was fate or a predetermined destiny. The fact your person died by suicide is traumatic enough, but to hear how some people try to account for it is to say the least, interesting. Hmm, predetermined destiny means that there was a plan before the person was born and at a certain point in life that plan came to fruition. Consider the comment that the person was weak; weak as in did not have the strength to go on living in this world at this time. Weak as determined by whom? How can anyone make a judgment call on this when they do not have all of the information and for those matters have never walked a mile in the deceased person’s shoes? Another comment has been stated as, you will have to come back and redo your life over again until you get the lessons you need to learn. Is that why other people do not choose to die by suicide; perhaps fear can be a motivating factor to living. Consider how some religions focus on the fear of going to hell if you take your life. Courageous has been a word used to describe someone who completed suicide. It must have taken a lot of courage to do what he/she/they did. Added to this comment was, I could never do that to myself or my family. Suicide is a selfish act for someone to do. How could they not think about those who are left behind after this type of death? Imagine the pain of a child, a parent, friend, co-worker and more dying. Why didn’t the person seek help or get more help if they were struggling with something, is often asked by everyone? To that I will mention that many people do seek supports, but for some it is not enough. The love of family and friends is sometimes not enough. Take a moment to think about how mental illness, bullying, prior losses in life, traumas, brain injuries, fatal diagnosis, not wanting to be a burden on anyone, loss of hope, depression, age, sexual orientation and how this is accepted by family or society to name a few reasons why some people have chosen to die by suicide. 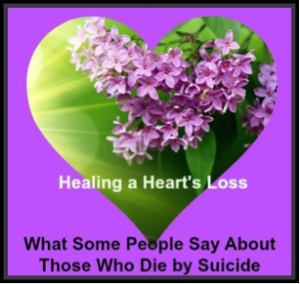 The main point here is that many people have many opinions about suicide death losses and for those who have died by suicide, often there are those left behind who always wish more could have been done to help their person, or wonder why.